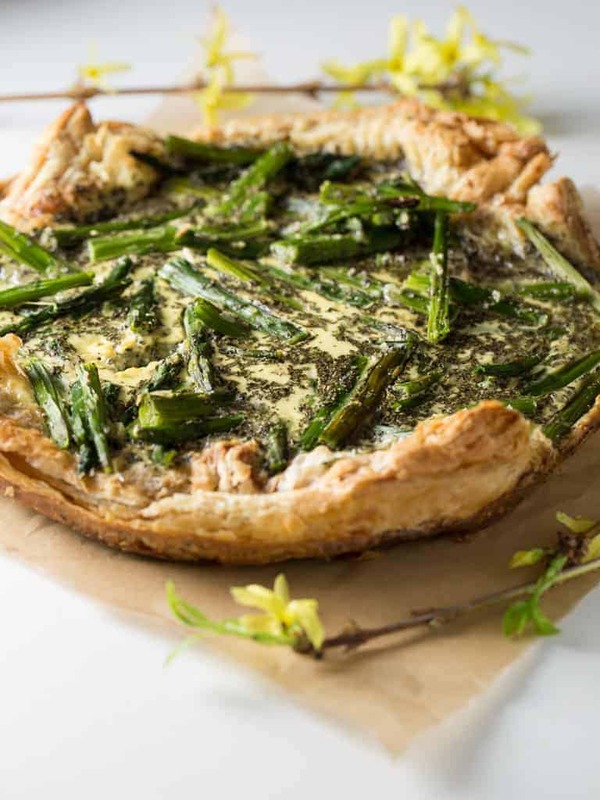 Fresh picked asparagus in a creamy filling on top a light crispy puff pastry shell makes this easy Asparagus Tart so beautiful and tasty that your friends will think you worked hours on preparing it. It’s a perfect quick appetizer or side dish for your spring luncheons or dinners. This recipe was originally in Par 3 Tea-Time at the Masters, Relaxed Entertaining cookbook. I tweaked it just a little by using puff pastry for the crust instead of pie dough. Personally, I like the light crisp texture and taste of puff pastry. When you are shopping for asparagus for your tart be sure and look for bright green or violet-tinged spears. They should feel firm, if they are limp and wilted then pass them by. I like to look for thin stalks because the larger they get the more mature they are and they have a greater chance to be woody and hard to chew. Also, make sure the tips are closed and compact. When the bunch is squeezed, the stalks should squeak. together. When you get home from the store, trim the bottoms of the stalks with a sharp knife. Wrap the cut ends in a damp paper towel, place in a plastic bag for up to three days in the refrigerator. 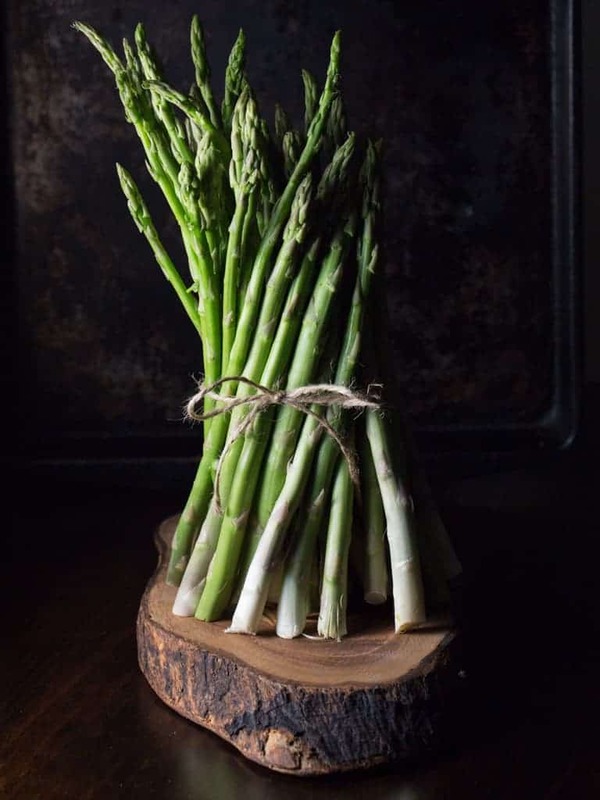 If you have room in your refrigerator another good way to keep your asparagus fresh is to treat your spears like fresh flowers. Just place the cut ends in a jar filled with an inch of water and cover the tops with a plastic bag and refrigerate. I find this way gives you a few extra days of storage. 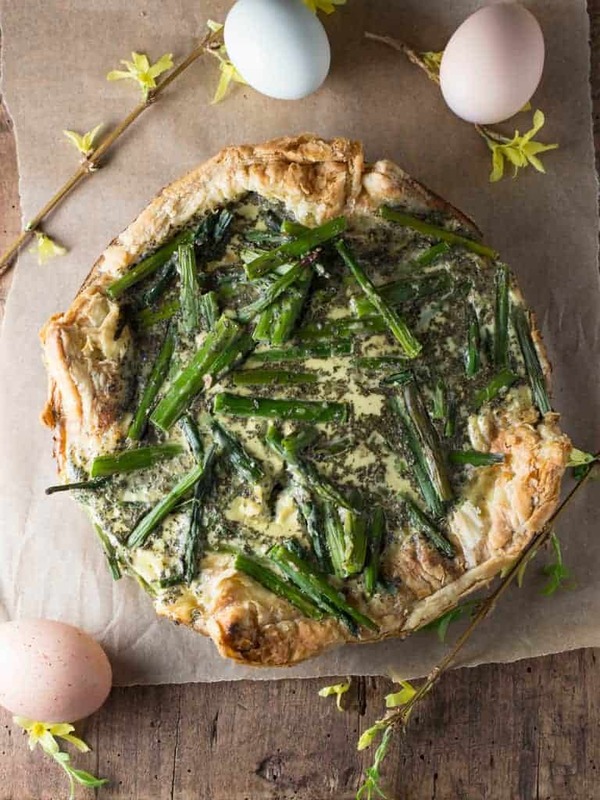 You do not need a tart pan for this Asparagus Tart recipe. My daughter made this recipe by lining a pie pan with thawed puff pastry dough. I love the rustic feel of the dish baking it this way. Bon Appetit shares tips with us on How To Get The Most Out Of Your Frozen Puff Pastry that are very helpful. Here are some highlights of their article. 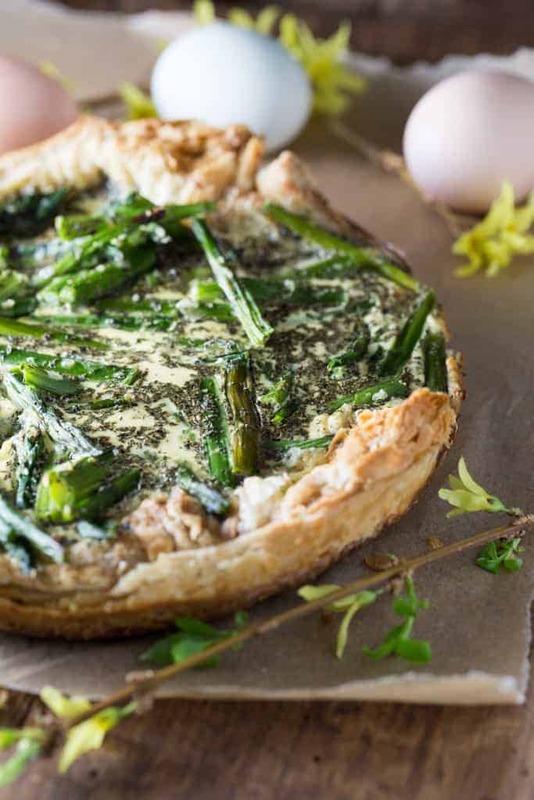 Fresh picked asparagus in a creamy filling on top a light crispy puff pastry shell makes this easy Asparagus Tart so beautiful and tasty that your friends will think you worked hours on preparing it. It's a perfect quick appetizer or side dish for your spring luncheons or dinners. Let your puff pastry defrost in the fridge or on the countertop according to the package’s instructions then lay pastry in a round 9-inch pie pan. Bake in a preheated 400-degree oven for 15 to 20 minutes, until golden brown. 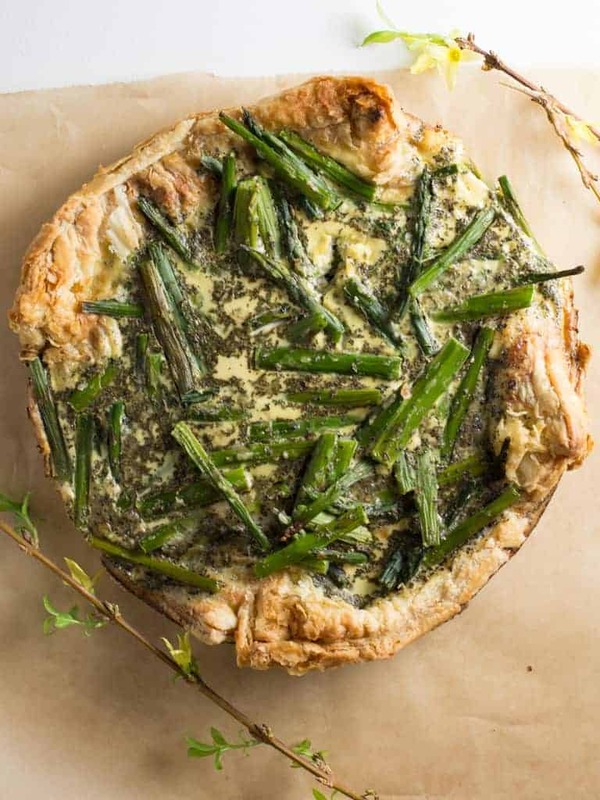 Arrange the asparagus in the baked puff pastry crust. Pour the egg mixture evenly over the asparagus. Bake for 30 to 35 minutes until the center is firm and lightly browned. Cover edges with foil if the begin to brown to much. Remove to a wire rack and let cool slightly. Loosen from the side of the pan with a sharp knife and remove tart and serve. You have really bee on a roll lately with all these great recipes! Thanks so much for sharing them.